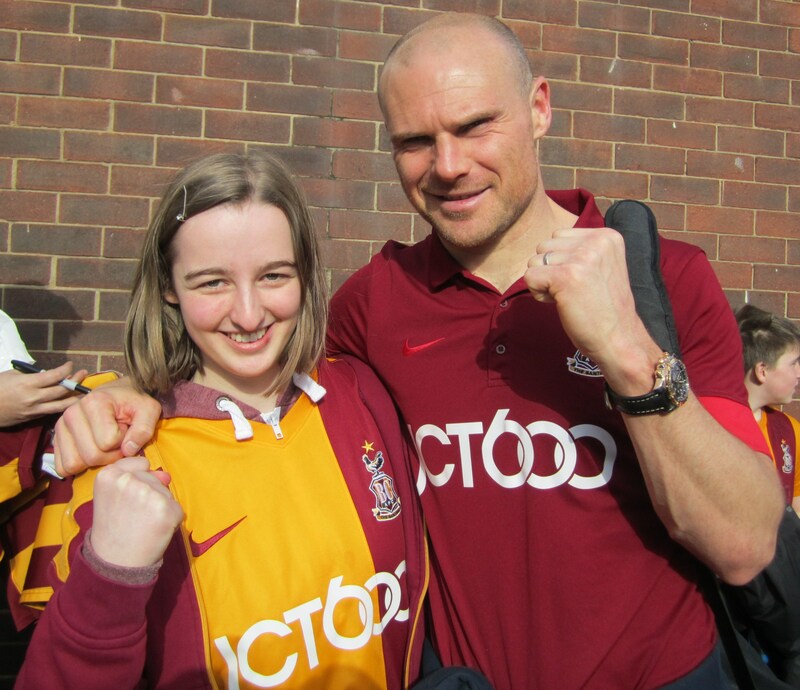 Part two of our new series sees WOAP deputy editor Katie Whyatt share her views on her time following the Bantams. I think it will be nine years in August – it was the first season in League Two after relegation under Colin Todd the previous season. It literally came out of my mum looking for a cheap way of entertaining my football-mad brother and me. I’d been watching Premiership football since the 2006 World Cup, but never really picked a team to support; so the fact under 11s were eligible a free season ticket was a huge part in luring us to Valley Parade, and it’s why I’m such a big advocate of these kind of schemes when I see them across the Football League. With the Premier League looking to increasingly distance itself from the lower echelons of the football pyramid, you can’t praise City highly enough for offering such inclusive ticket prices. At nine-years-old, the atmosphere and the reception Stuart McCall received blew me away – then Guylain Ndgumbu-Nsungu netted a penalty and that was it. It depends largely on what time I decide to crawl out of bed; but I always go to games with my mum and auntie. We all meet at my Grandma’s house beforehand, chat about the previous week and make a score prediction, then drive down to Valley Parade while listening to the Pulse. Gary Jones is probably my all-time favourite. He was the pulse of the History Makers side, the lifeblood behind everything that endeared them to us – I think it was Gary Jones that taught me what really matters about football. David Syers, for how his dynamism, vision and energy injected a beacon of light in that woefully tragic side; his release still seems to be a bone of contention for some people, but I wouldn’t have swapped him for Gary Jones – not ever. David Wetherall and Mark Bower, when I was younger, for the commitment to the cause, and Billy Clarke, for being integral in redefining the shape and ceiling of this team. 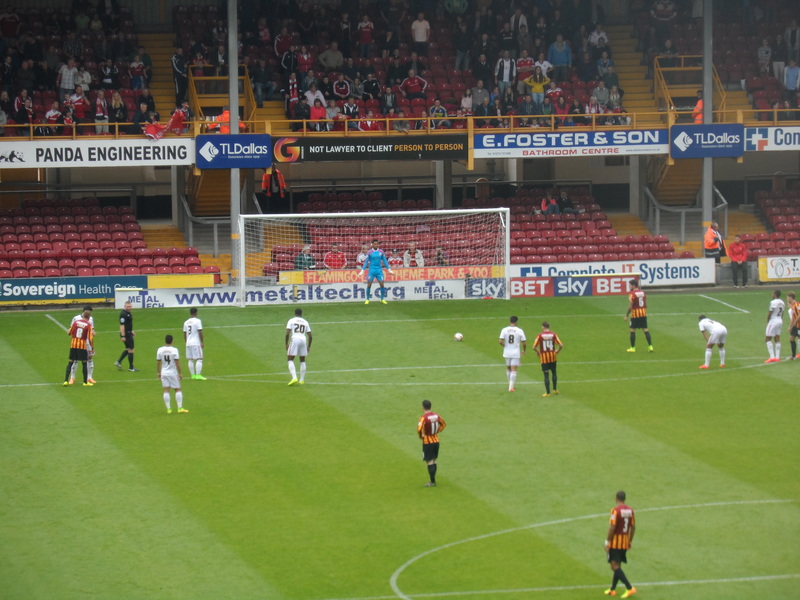 Controversially, Nahki Wells – it didn’t end well, but it doesn’t matter. Only when he left did you realise how privileged you were to watch him. With my twin brother being a Liverpool fan, Steven Gerrard is the obvious one. I think the first matches I can remember in vivid detail are Istanbul, then the FA Cup final of the following year, just for the sheer theatre of both of them. The latter against West Ham, with Liverpool constantly pulling it back but being denied, barely a minute left on the clock and Gerrard’s body rigid with cramp – for him to produce that goal, in that context… He was living every kid’s dream and refusing to let go of the glory. Arguably the best two finals of modern times, and they were the first two I experienced. I also loved watching Xabi Alonso, and I like Buffon, for being the final bastion of the great traditional European players. Luke Freeman is something else, too. More broadly, the likes of Kelly Smith, Eniola Aluko, Karen Carney and Steph Houghton, for what they’ve done in terms of helping to redefine the role and perception of the women’s game. I’ve been lucky enough to visit Anfield to see Liverpool play in the Premier League. The rendition of You’ll Never Walk Alone was spine-tingling and so moving; it was a privilege to be able to see the scarves held aloft, and to join in with a Liverpool tradition like that. And obviously our little holiday home… WEMBERLEEEYYY! Rotherham’s New York Stadium is impressive, but ultimately feels too sterile. Stadium MK, for similar and slightly more obvious reasons. I think the full extent of my 13 year old self’s political activism was signing a petition to get the ‘Dons’ suffix removed from the MK Dons’ name. Right here, right now. 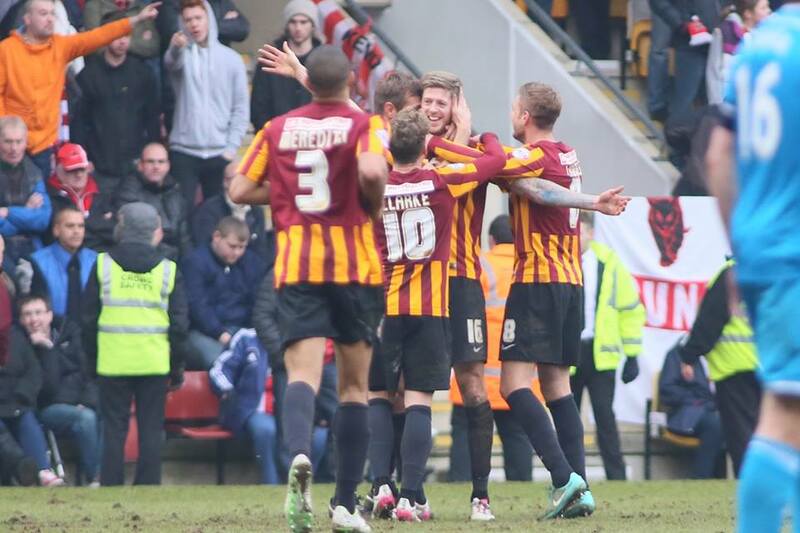 The pride and happiness I feel when I pull on my City shirt and head down to Valley Parade is at its zenith. There’s something so real about our club and the spirit that inhabits it, and I love absolutely everything about our team – I love that we’re essentially a children’s fairytale. I mean, we’re just ace! Like, Rory McArdle was on Match of the Day and they called him Rory McRory – City were on Match of the Day! It’s inconceivable. But I think I’m also at a nice age to be experiencing this, that limbo between childhood and adulthood having never really grown up. I’ve seen enough of the old order to appreciate the magnitude of what’s happening now, but I’m still able to dream – and I think a lot of that is down to Phil Parkinson. Wigan. Arsenal. Aston Villa. Chelsea. Sunderland. Leeds. For me, being in the ‘younger end’, I never had anything like that to celebrate – I can remember beating Wigan and thinking it was the most mind-blowingly brilliant thing that had ever happened to a football club in the whole entire world ever. Now, it’s like a footnote under the Achievements section of the team’s CV, and I think the fact we’d been able to reduce it to that is an accolade in itself. Before that year, you’re looking at beating Notts County 3-0, with a Peter Thorne hat-trick – the first I’d seen at Valley Parade; Leeds away under Peter Jackson and nearly snatching the bragging rights; the JPT run with all the penalty shoot-out wins; the Nahki Wells thunderbolt against Rochdale; Tom Adeyemi’s ‘IT’S GONE OVER THE LINE’ goal against Rotherham; and Luke Medley’s stunning half-volley against Wrexham under Stuart McCall – my first City home win. It starts with ‘C’ and ends with ‘A’. ‘Nuff said. It sounds daft, but none of them, even the woefully mundane and forgettable. I think I needed that logjam of mediocrity to make me truly relish the good moments, to make me stand back at Wembley II and go, we deserve this. Football’s horrible at times, but I’d take another fifty Bristol City scorelines for a fraction of the joy I felt that night when we beat Chelsea. This team means so much for us because they’re real, because they do things in the right way – they’re the team we conceived in our wildest dreams. But it only feels this great because we can look back at everything we had to endure before. How you can’t stop thinking about it. How it invades every fibre of your being and takes over you. How you’re consumed by it. It’s the clingiest partner ever, but worst, because they’ll never leave you and you can never forget how they made you feel. It can be the first thing you think of when you wake up, the last thing you think of when you go to bed. The potential for such a cult level of obsession terrifies me and we’re constantly teetering on the edge. Replace the bulbs in the scoreboard so you can actually tell whether we’re on 3 minutes or 8 minutes. Peter Taylor. How many players did we go through that season – 40? It was such a poor quality team, the dressing room just full of faceless strangers. I got what Taylor was going for, but it wouldn’t have tasted good if it had come off. It was ugly, coarse, energy-sapping. We needed success in the Parkinson way for it to be meaningful. I’ve tried to limit myself to only a handful of Parkinson players to stop this from becoming a History Makers Reunion, so that hasn’t leave me with an awful lot to play with and we’ve got a rather narrow looking midfield, but LOOK AT THAT ENGINE ROOM! I really enjoyed that, particularly about the least favourite thing being unable to stop thinking about football. I am glad you mentioned Luke Freeman—I cannot understand why he is not a Premier League player. One point of contention—I do not think City went down under Colin Todd. I have always thought they went down because they got rid of Colin Todd. Please keep on writing and entertaining us. Thanks.